Here’s a look at some of the latest additions to Collection 6 releasing this month at Clear and Simple Stamps. Today I’m showing off a new die, Party Favor 7, along with some previously released craft themed stamps in a gift set that’s perfect for a crafting buddy. The gift set includes a box made using the Party Favor 7 die. It fits one of CSS’s Copic marker trios perfectly! I cut the box from kraft cardstock and assembled it using CSS’s Simple Adhesive. It’s dressed up with some silver glitter tape and a silver cord tied button. 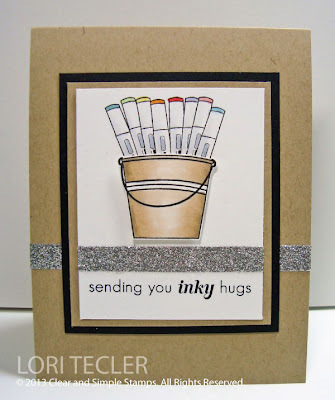 I stamped the “you color my world” sentiment from the Craft Room set on the box in black ink, then filled it with three markers--I used the ones in Blue Green Trio 3. The other gift item is a sketch book, made from a small wire-bound notebook I found in my alterable stash (I think it came from Target). 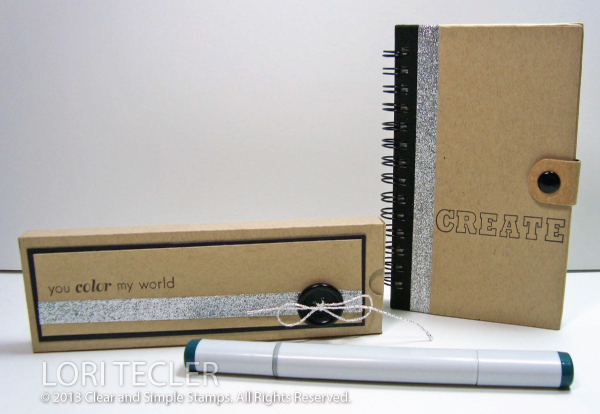 I stamped the “create” sentiment from the same set on the cover in black ink, then added a strip of silver glitter tape. 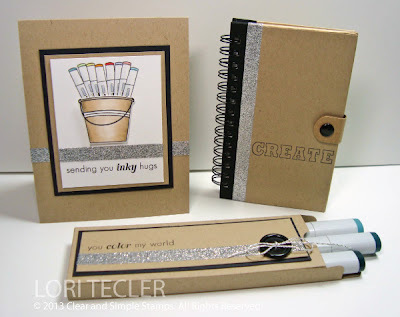 I wanted to keep the embellishing simple and not bulky so that the notebook was easy to use. To go with the gift set, I made a coordinating card using images and sentiments from the Craft Room, Crafty Sentiments, and Craft Room Bonus stamp sets. I used the images to make a bucket filled with a rainbow of Copic markers. The bucket is stamped on a separate piece of cardstock, cut out, and adhered to the card with foam tape. 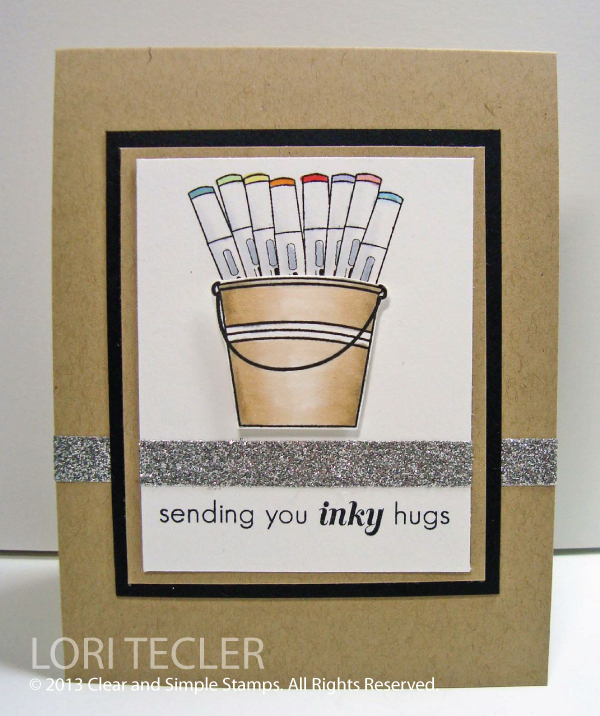 I stamped the “sending you inky hugs” at the bottom of the image panel and divided it from the rest of the card using a strip of glittered tape. Lori, this is just the perfect gift set and card for a crafting friend. I love the sentiment! this whole set is just PERFECT. Who knew the box would fit a few copic markers? Amazing! This is an amazing gift!! I love the markers in that box!! What a fabulous set! LOVE it! Perfect gift! Love the combination of kraft and black which is perfect for both female or male! What a great gift! I love the combination of kraft and glitter. So cool!